Now you can view your magnified target using a bright, clear monitor rather than microscope oculars. While this is typically done using a camera/computer combination, sometimes that is more complexity than the situation requires. Even when using just a video camera and separate monitor you have to worry about positioning the monitor someplace convenient, comfortable and ergonomic. 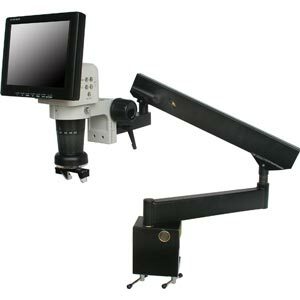 Available with an 8" or 10.4" monitor, this LCD Zoom Microscope solves this problem perfectly with its built-in camera, monitor and ring light. You can't beat the convenience of a swiveling monitor which brings operator comfort, ease-of-use, multi-user viewing and many other advantages, plus the simplicity of an all-in-one solution. It also has a built-in, adjustable, LED ring light so the system is always ready to use. Perfect for high-throughput inspection stations, Q.A. and Engineering labs, conference rooms, or anyplace you want to quickly and easily magnify a sample. You don't have to worry about booting up a computer or any of the related complexity and maintenance headaches. It also has two extra video outputs so you can drive additional video monitors, or if you want to be able to capture, annotate or measure the image you could plug it into a computer capture card. Color 8" or 10.4" LCD screen attached with adjustable image, contrast and brightness settings. Wide viewing angle for mutliple-viewer applications, conference rooms, etc. Monitor swivels vertically. 0.7 ~ 4.5x zoom body with detents. 1:6.5x zoom ratio. 35 degree oblique viewing attachment included when a straight-down view is not desirable. Built-in laser pointer to quickly locate the view area. Optional objectives: 0.3x, 0.5x, 0.75x, 1x (included), 1.5x, 2x. This allows a very wide magnification range. Built-in variable intensity LED ring light. In addition to the Flexible Arm Stand, a wide variety of other stands are also available. Optional bolted table or wall mount base for Flexible Arm Stand also available (see Available Objectives & Accessories link below). Universal power supply. 85-265vac, 50/60h. Stand Flexible Arm. Other optional stands available. Video Output Dual Output. Composite (TV) Video and S-Video simultaneously. NOTE: Cables not included, see accessories. Oblique Viewing 35° oblique viewing attachment included. Includes integrated 0.75x objective lens. Viewing Angle Approx. 150°. Swivels vertically.